First impressions are important these days, and nothing works better than a beautiful, healthy smile. People just tend to gravitate towards those with perfect teeth—it’s just a natural part about being human. At The Dental Center of Westport, we understand the importance of a healthy smile, which is why we work to help our patients achieve one every day. However, a truly stunning smile can mean so much more to a person beyond their oral health. Today, Dr. Masha Kogan, your dentist in Westport, is going to discuss what a beautiful smile can do for you and how she can help you get one. For many people, their sense of self-confidence radiates through their smile. If they’re feeling good about themselves, they’ll smile all day, every day, to friends and strangers alike, and of course, the exact opposite is true as well. We’ve all had a bad day where a friend has simply told us to smile so we can start feeling better about ourselves. This is why we try to give people beautiful smiles every day. We know as well as anyone that it has a direct correlation to self-esteem. If people feel confident about their teeth, that sensation can easily filter into every other part of their life. They’ll feel more motivated to pursue their goals, to improve their relationships, and to do what really matters to them. This might seem like a bit of a stretch, but we hear these kinds of stories in our office each and every day. A person who used to be ashamed of their teeth came to us, we helped them, and then it seemed like everything in their life got easier. They were eager to show off their smile, which made them seem much more warm and approachable, and that improved all of their personal and professional relationships. It’s truly amazing what a simple smile can do. Of course, if you aren’t proud of your smile, it can easily feel like it is holding you back. It can make you hesitate to start important conversations and fill you with self-doubt. Fortunately, at The Dental Center of Westport, we can turn that all around. 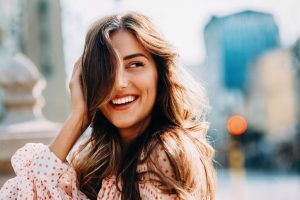 We have a variety of preventive, restorative, and cosmetic services that can address any dental issues you have and leave your smile sparkling. We can do everything right here in our office. We can address any oral health problems you might have (tooth decay, gum disease, etc. ), and then we can give you a smile you’ll really be proud to show off. You’ll be amazed at how good you feel about yourself afterward, and how motivated you’ll be to live your life to the fullest. It can all start with a smile, and we’re here to give it to you. If you’re ready to see what a beautiful smile can do for you, be sure to contact our office today. No matter what you need, we can provide it, and we can’t wait to hear about how it improves your life.